Know the ins and outs of unbundling to avoid compliance traps. The concept of unbundling (ie, billing multiple codes for a group of procedures that are typically covered by a single comprehensive code) is one with which many coders struggle. Like many areas of coding compliance risk, physician documentation—or lack thereof—is often the culprit. Coders may find themselves between a rock and a hard place when trying to decide whether to report procedures separately or take the “safe” route and follow bundling rules. Some clinical scenarios are easier for coders to decipher than others, says Kristi Stanton, RHIT, CCS, CPC, senior consultant for Haugen Consulting Group in Denver. For example, CPT codes for the removal of a mass include the biopsy of that mass, and coders shouldn’t report these procedures separately. “If you remove something, it’s going to go to pathology anyway,” Stanton says. However, applying this somewhat intuitive rule to more complex scenarios can be difficult. Consider colonoscopies involving multiple masses in distinct locations on the colon. When a physician biopsies a mass from one area of the colon and then moves to a different area of the colon to remove another mass, coders can code the biopsy of the first mass and removal of the second mass separately, assuming physician documentation describes the fact that the masses were located in two separate and distinct areas, says Stanton. “With colonoscopies, I’ve found that coders end up coding cautiously or without documentation. [The latter] is definitely a compliance risk,” she says. Physician documentation is a large part of compliance related to unbundling, says Stanton. And documentation shouldn’t reflect just separate and distinct sites; it should also clearly reflect separate and distinct incisions, when applicable. For example, an open gallbladder removal includes an incisional hernia repair when the repair is performed at the same time as the removal. The exception is when the removal and the repair are performed through separate incisions (eg, if the incisional hernia repair is performed lower on the abdomen compared with the gallbladder), thus requiring more work on the physician’s part. When physician documentation explicitly describes the separate incisions and location of the repair, the two procedures can be coded separately, Stanton says. Documentation of anatomy and the specific location in which the procedure is performed is paramount, says Alice Zentner, RHIA, director of auditing and education at TrustHCS in Springfield, Mo. For example, to separately report arthroscopic debridement/shaving or articular cartilage and arthroscopic meniscectomy performed during the same session, the procedures must be performed in separate compartments of the knee (ie, the medial, lateral, or patellofemoral). Physician documentation must clearly state the different components in which each of the procedures was performed. • Column 1 is the comprehensive code (ie, the one that includes the code listed in column 2). • Column 2 is the component code (ie, the one that is included in the code listed in column 1). • 9: not applicable (ie, no modifier is necessary, as the edit is inactive as of the posted date; services may be separately billable). • separate lesion or injury. Zentner provides the following example of when it would be appropriate to append modifier -59: A physician removes a lesion and performs a simple closure. Coders should report a code for the lesion excision, which includes the simple repair. Later in the day, the same patient falls, the wound opens, and the physician must resuture. Even though the date of service for both procedures is the same, coders can report the second closure with modifier -59 to indicate they were separate and distinct procedures. She provides a second scenario in which it’s appropriate to append modifier -59: A patient undergoes a lesion excision for a 2-cm X 3-cm lesion on his or her trunk followed by a repair with a rotation flap. During the same encounter, a benign lesion measuring 2 cm is also excised from the trunk followed by a simple closure. Coders should report 14000 (adjacent tissue transfer or rearrangement, trunk; defect 10 sq cm or less) for the first procedure and 11402-59 (excision, benign lesion including margins, except skin tag [unless listed elsewhere], trunk, arms, or legs; excised diameter 1.1 to 2.0 cm) for the second procedure to demonstrate they were separate and distinct procedures. However, just because the NCCI edits allow coders to append modifier -59 to a particular column 2 code doesn’t mean they can—and should—do so, says Kathy DeVault, RHIA, CCS, CCS-P, manager of professional practice resources at the AHIMA. The good news is that most encoders include NCCI edits that automatically identify incorrect code pairs, says Stanton. When a CCI edit is triggered, coders can then determine whether modifier -59 is justified based on the documentation. If it is, the modifier will override the edit and allow for payment of both procedure codes (ie, column 1 and column 2 codes). “I often call it the ‘magic modifier’ because it makes the NCCI edits disappear,” Stanton says, cautioning coders that those who automatically append it without looking at the larger picture could be putting their hospital at risk. Although the NCCI edits help catch some incorrect codes, others may fall through the cracks. Why? Some codes are assigned directly through the chargemaster and may not be available for a coder’s review at the time of coding, says Stanton. This means coders may not have an opportunity to review both codes, compare them against the NCCI edits, and either append a modifier or remove an inappropriate column 2 code, if necessary, she explains. To ensure compliance, an individual with significant coding and NCCI edit training must ultimately run all HIM- and chargemaster-driven codes through the NCCI edit software prior to claim submission, says Stanton. A common example that demonstrates the importance of this final level of review relates to fluoroscopy, a radiological procedure used during a variety of other operative procedures to obtain real-time moving images of internal structures. The fluoroscopy code is generated from the chargemaster, while the other operative procedure code is usually assigned by a coder, says Stanton. Although fluoroscopy is almost always bundled into the code for other procedure, a coder should review the claim in its entirety to ensure compliance and identify any rare circumstances in which modifier -59 is justified. Another example involves electrocardiograms (ECGs) performed with cardiac catheterizations. Coders typically code the catheterization; however, the code for the ECG is usually generated through the chargemaster. The ECG is often bundled into the cardiac catheterization, but there may be instances in which the two can—and should—be coded separately. DCS Healthcare, the recovery audit contractor (RAC) for Region A, has already identified this as a target issue, stating an overpayment may exist when outpatient hospital providers bill separately for ECGs performed on the same date of service as cardiac catheterization procedures. It is currently performing automated reviews related to this issue in outpatient hospitals. Clues that may indicate the ECG was performed separately include the presence of a separate rhythm strip and/or a different revenue code indicating the ECG was performed in a different department of the hospital, she adds. Other resources where coders can find information about which codes are bundled are CPT Assistant and CPT Manual, the latter of which often includes parenthetical notes indicating whether a procedure may be performed separately, says Zentner. For example, a cystourethroscopy (including ureteral catheterization) with removal of ureteral calculus includes a temporary ureteral catheterization when it’s performed during the same operative session, per instructions in the manual. 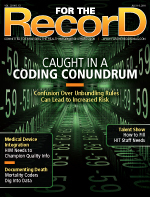 Experts agree that RACs will likely continue to target various unbundling-related issues. “It’s a really easy source of data mining for Medicare or any one of the governmental agencies,” says DeVault. Stanton agrees, adding that RACs are constantly looking for new issues to emerge. “With RACs, just because something isn’t on their radar today doesn’t mean that they’re not continually looking at the data and looking for strange patterns,” she says. Bronchoscopies are already on the radar, Stanton adds. In particular, RACs are looking for claims that include more than one bronchoscopy during a single date of service (excluding those with modifier -59), she says. “It’s unlikely that the patient will have more than one bronchoscopy in a day, but it’s not impossible depending on the patient’s situation,” Stanton says. It’s crucial for coders to identify cases in which it’s appropriate to append modifier -59 based on physician documentation, she says. Although Connolly Healthcare, the RAC for Region C, hasn’t officially listed unbundling related to MRIs as one of its targets, the company’s website includes a case study detailing a payer-directed audit that revealed a provider had billed separate CPT codes for MRI scans—one that represents the image without contrast (eg, 74150, abdomen scan) and one that represents the image with contrast (eg, 74160) rather than the appropriate combined “global” code (74170), which is an image without contrast followed by the introduction of additional images with contrast. Through advanced data-mining techniques, Connolly was able to identify multiple instances of unbundling and applied this analysis to other types of MRI and CT scans where unbundling was taking place. It’s important for coders to understand the timing of the scans, says Stanton. In some instances, they are performed successively to obtain specific contrasting images. “When this is the case, coding the MRI without contrast separately from the MRI with contrast would be inappropriate,” she adds. Experts say creating a culture of compliance can go a long way in terms of minimizing the risk related to inappropriate unbundling. First, ensure your organization is using the most up-to-date version of the NCCI edits. The CMS updates the edits annually, and using the most recent version can help avoid denials and compliance risk. Also make certain your organization is using the hospital outpatient prospective payment system version and not the physician version. Next, establish an internal policy on how to report potential compliance risks and possible abuse. Coders should feel comfortable approaching their manager if they suspect noncompliance related to modifier -59 and unbundling, says Zentner. Finally, perform proactive audits to identify areas for improvement. To give hospitals a sense of volume, Stanton suggests running a report to identify all cases in which modifier -59 appears. Next, look for patterns with specific code pairs. For example, if you identify a significant number of modifier -59s with ECG and cardiac catheterizations, you might want to research why this is the case. Ask the catheterization lab about the standard protocol for performing ECGs. Are they typically performed before, after, or during catheterization? In some cases, a more in-depth audit may not even be necessary if you can better understand a context for the data, says Stanton. In other cases, a more appropriate modifier (eg, finger modifiers, laterality modifiers, modifier -51 [multiple procedures]) may be more appropriate than modifier -59, says DeVault. Coders who don’t take the time to determine which modifier is most appropriate rather than assume modifier -59 applies are simply raising a red flag to Medicare. “That’s a slam dunk for Medicare in terms of their initiating an audit,” DeVault says.